With four netbooks already released under PC World's in-house Advent brand, it is no surprise to see yet another model added to the range. While the Milano is an affordable and functional device, it fails to stand out. The 1.3kg chassis is highly portable and slips easily into even the smallest bag. The 3-cell battery runs for 166-minutes for basic use at home or on the move. The combination of silver and black plastics adds style, but won't suit all tastes. Build quality is sturdy, but the glossy plastics are easily tarnished. The first clear flaw is the design of the 10.2-inch screen. When fully open, the panel only folds back 40 degrees from vertical. This makes it awkward to get a comfortable viewing angle on your lap or on a seat-back table, for example. Image quality is unremarkable. Brightness, colour and contrast fail to impress, but suit basic daily use. The matt-TFT screen coating is useful for frequent travellers, as it all but eliminates reflections in bright conditions. The keyboard spans the width of the chassis and proves comfortable to use. We noticed no sign of flex, even when typing at speed. The large keys respond well, but produce a noticeable clacking sound during use that may irritate. 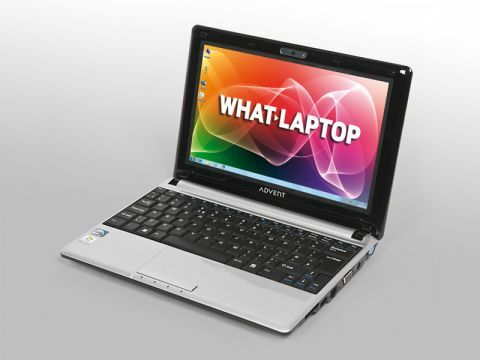 The Intel Atom processor and 1024MB of memory provide power for browsing the internet and basic office tasks. The 160GB hard drive provides ample storage for carrying your music, photos and work files. There is no HDMI port for connecting to an HDTV, although a VGA port lets you connect to analogue screens. Three USB ports let you connect peripherals and 802.11n Wi-Fi allows the fastest possible wireless network connectivity. Windows 7 Starter software is installed. While it runs slower than Windows XP, it is far better featured and a huge improvement over Vista for netbooks. Overall, the Milano is a usable and great priced machine, but struggles to stand out in an already crowded market.